Mother Goose illustrated by Tasha Tudor, a 1945 Caldecott Honor Book, sweetly retells 87 pages of well-loved nursery rhymes. Several times I have read Mother Goose compilations with many unfamiliar poems, but I was pleasantly surprised that I knew most of the verses in this book and that my children were saying many of them along with me as I read to them. 1. “Excellence of execution in the artistic technique employed.” – Vibrant watercolors superimposed on beautiful, old-fashioned line drawings on every other page. That this artist was also well-known for her work on Christmas cards, calendars, and Valentines is no surprise, judging by her charming and heart-warming art work in this book. 2. “Excellence of pictorial interpretation of story, theme, or concept.” – These children-friendly pictures make each rhyme easily understood. 3. “Appropriateness of style of illustration to the story, theme or concept.”- These pictures do seem to fit well with the typical image seen of Mother Goose and her characters. 4. “Delineation of plot, theme, characters, setting, mood or information through the pictures.” – As this is a compilation of individual verses no ongoing plot, theme, or setting is evident. The mood is generally light-hearted, which fits these rhymes for children. The visual information does help children to understand some of the less-used vocabulary as well as to remember the poems. 5. 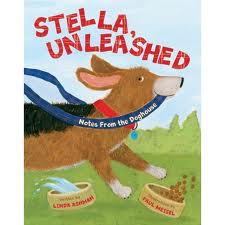 “Excellence of presentation in recognition of a child audience.” – Even though this book was longer than we usually read in one sitting, my children begged for me to keep reading while they enjoyed the pictures until we had completed the entire book. 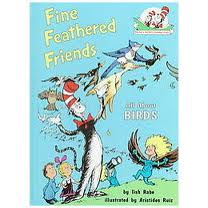 Summary: Although I am not usually a fan of Dr. Seuss-type books, I would recommend Fine Feathered Friends by Tish Rabe. 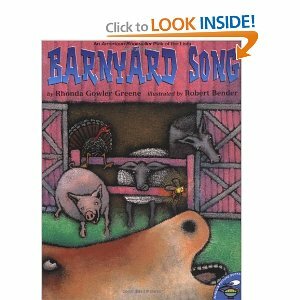 Today I read this book to a group of preschoolers who were learning about birds, and it was obvious that they were intrigued. They studied the Seuss-esque pictures closely and asked many complex questions about the reading. The book begins with an overview of the characteristics of birds, then discusses specific qualities of particularly fascinating birds, then close with the human characters getting a bird for a pet. I found that the kids and I learned new tidbits about birds. Pros: Fun, detailed illustrations. Facts communicated in a fun, rhyming, Seuss-like tone. Cons: Well, just that I am not particularly a Seuss-ite!